Here are some examples of different things you can have Jimmy make for you. Some items here, such as dragonfly pins and note pad holders, are in a lower price range, and they make great gifts. Jimmy also makes business card holders, tooling into the leather your own business card's image and text. 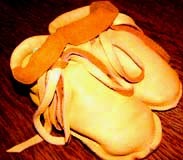 Deerskin Baby Booties. Jimmy makes these in two sizes, for babies 0-6 months, and for 12 months, roughly. They make a really good baby present and often become the first shoes people save for their memories. $80. plus shipping, for 12 month size. Note Pad Holders. These little babies are really handy for carrying quick notes, like store lists. Blank business cards fit in the outside part for notes, and the case opens to hold more cards inside. Can be made of any leather, with any design, or be plain. Left: tooled leather. Right: Snakeskin. Size 3" x 4." $75.-$150. each, plus shipping. Dragonfly Pins. These are sculpted, tooled, and painted leather. They come in whatever color you want, including leather-dyed browns. Size: 5-6"long x 3.5-4"wide. $100. each, plus shipping. Pen Cases. This example is of a fountain pen case, tooled and painted with an egret in a marsh, under the full moon. The owner's initials are tooled on the back. Any images may be used. Price depends on size and complexity, as usual. Range: $150-$300, plus shipping. Similar to this one: $250. Web site design © Susan Shie 1997-2017. Site opened October 15, 1997. Made on a Macintosh G-4, using Adobe PageMill. This page last updated February 27, 2017.